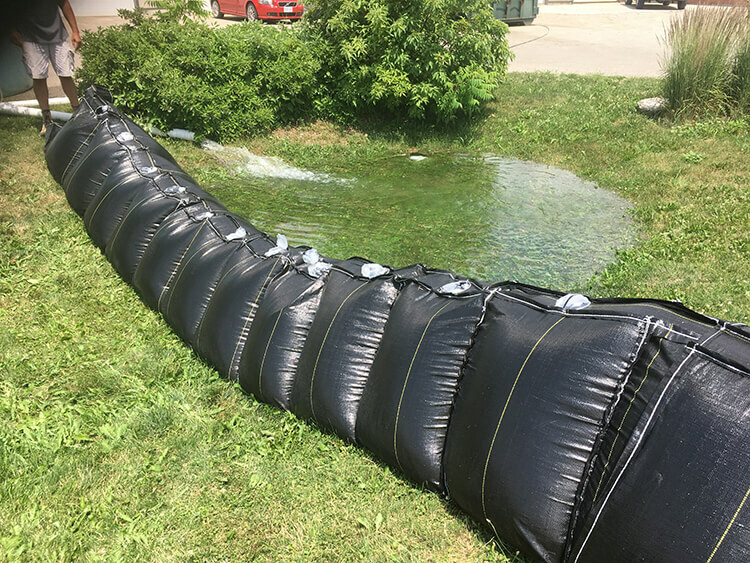 Canada Flood Control & Protection Products | EHS Sales Ltd.
Fight water with water, with the TriWater Bag! The Triwater Bag is environmentally friendly, using water to fight water. It’s reusable, easy to store, and cost-effective. It comes compact which allows for fast, affordable shipping. 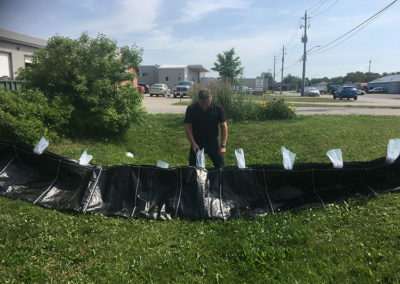 The Triwater bag is easy to set up and requires minimal labour. Simply unfold, place, and fill in the area you wish to protect. 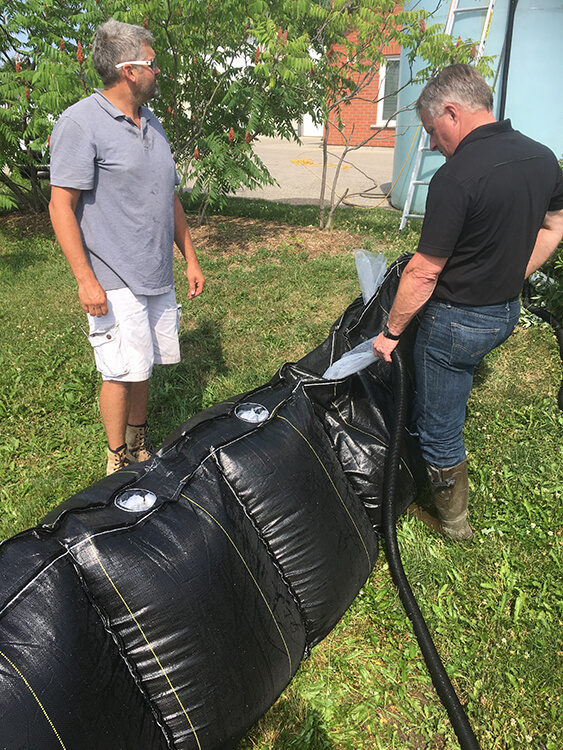 Place the hose inside the bag and begin to fill with water. 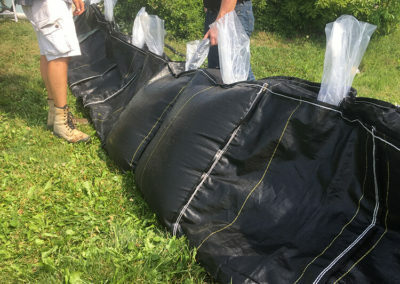 Once each bag is full zip tie the bag tight. Continue filling each bag moving from the lowest plain, moving outward. This quick and easy process allows two people to set up two feet every two minutes. The Triwater bag extends to 24 linear feet total, comprised of two-foot compartments with heavy-duty plastic liners. liners available if needed. Easy to add on, fit the next 24 feet into the existing bag. Click on an image below and scroll through to see how easy it is to install the Triwater Bag, creating a durable, effective flood barrier anywhere you need protection. 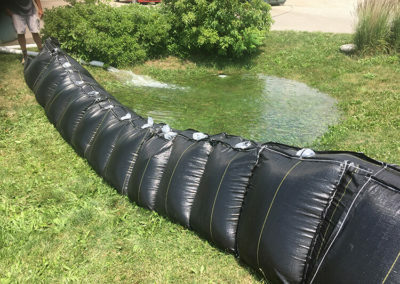 Lay Triwater Bag out along the perimeter of the area you want to protect from flooding. Begin filling the 2-foot compartments with your garden hose. Complete filling all 12 compartments for maximum protection. When filled, the Triwater Bag creates a 24-foot long flood barrier. Connect additional bags for larger areas. 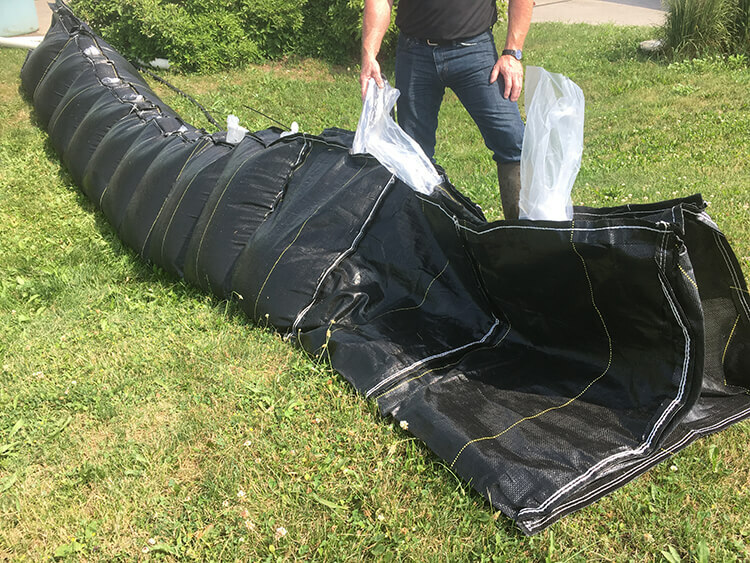 For every 12 feet of TriWater Bags you set up, EHS Sales recommends a 2-foot TriWater Bag compartment be placed and filled behind for support.